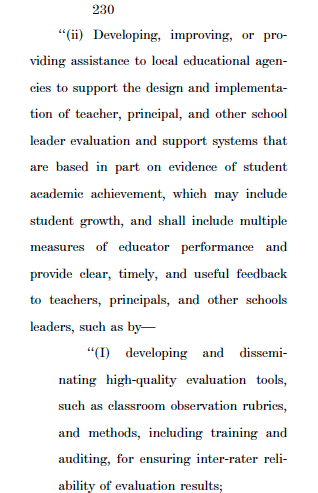 Since yesterday's release of Lamar Alexander's Senate Committee's new atrophied version of NCLB (this one is less than 600 pages), Arne Duncan must be feeling entirely unappreciated this morning. After all, Duncan has been a loyal licker of oligarchic boots for years now, having begun at the top as the golden boy trainee of none other than Paul Vallas in Chicago. His rise to the edu-apex was quick, having been picked in 2008 by Gates and Broad to be the front man in Washington for the monstrous facelift of public education into a hideous image that only a profiteering whoremonger could love. 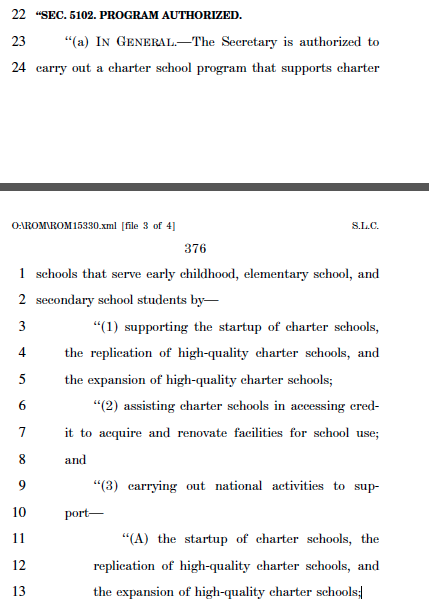 In the new version of the Elementary and Secondary Charter School Expansion Act, there will be no Washington middle man required to build the corporate case for a charter school monopoly inside those parts of urban America where poor kids live. 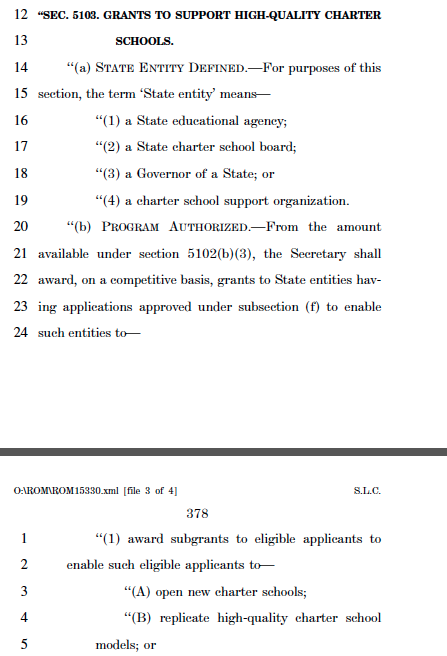 Under the new plan, the federal money will go directly from Congress to the states or to another "state entity," which now may include a "state charter school board" or even, get this, a "charter school support organization" (see 5103 below). 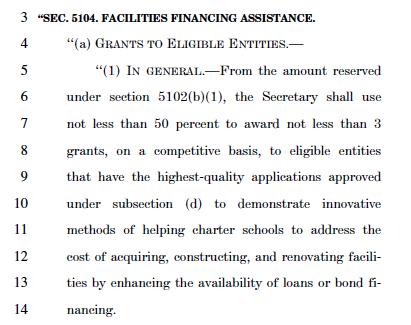 This Act, if approved, will further erase the boundaries between corporations and government, and the main job of the USDOE will be to service the applications for extra assistance for charter school expansion, charter school facilities, training of charter school staff, incentivizing test-heavy merit pay plans, and other corporate "innovations" aimed to replace public schools with corporate welfare schools and to further diminish the profession of teaching. 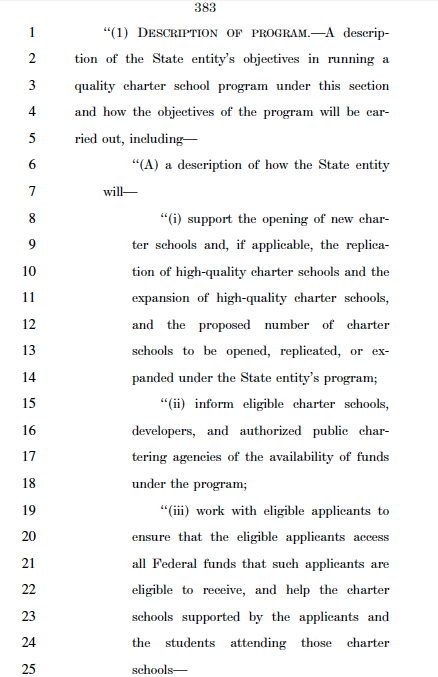 The Alexander plan gives 41 pages to detailing charter assistance, growth, and expansion, with no mention of the shameless segregation within charters. The plan dedicates 4 pages to outlining a disappearing magnet school assistance plan. 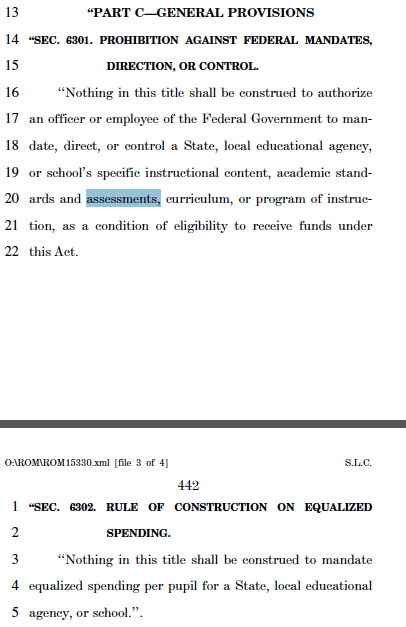 There is nothing in the Alexander plan to limit high stakes tests or segregative programs that may be dreamed up by states or a "state entity," and there is a clear ban on any effort by the feds to enact rules for equalizing state funding, per Sec. 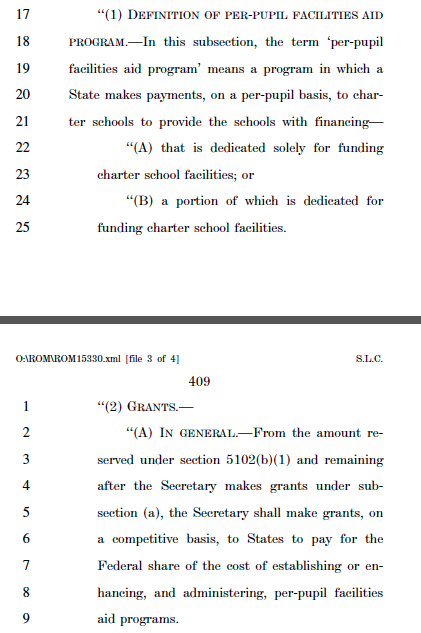 6302 (below):"Nothing in this title shall be construed to mandate equalized spending per pupil for a State, local educational agency, or school." 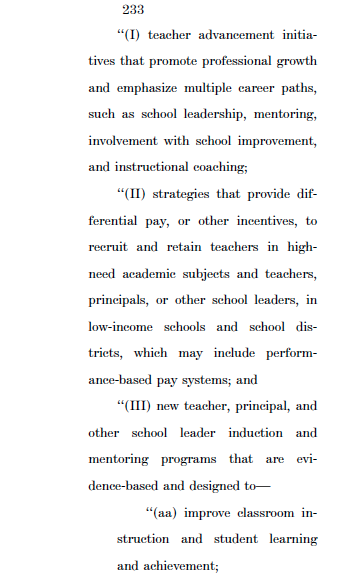 How anyone could like this Bill (even Diane Ravitch) is beyond me. It underscores what it takes to satisfy some who, otherwise, are always talking tough and saying everything required to put a damper on the educational revolt by teachers and parents that is sure to come if this piece of dreck moves forward. 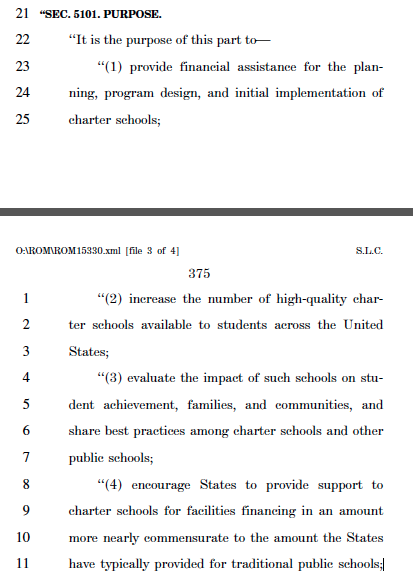 How do they define "high quality charter school?" High quality charter schools are the ones that have interested parents, fewer ELL and SPED students, fewer low performers, fewer males, and more resources. They also are laser focused on test scores and have control systems that no middle class parent with options would allow. They spend much more time in school, and their teachers are worked into the ground. The Feds' definition? The ones with the highest scores, of course. They asking for in-service activities to be "evidence based." Where is the research that vets all the money that has gone to charter schools? 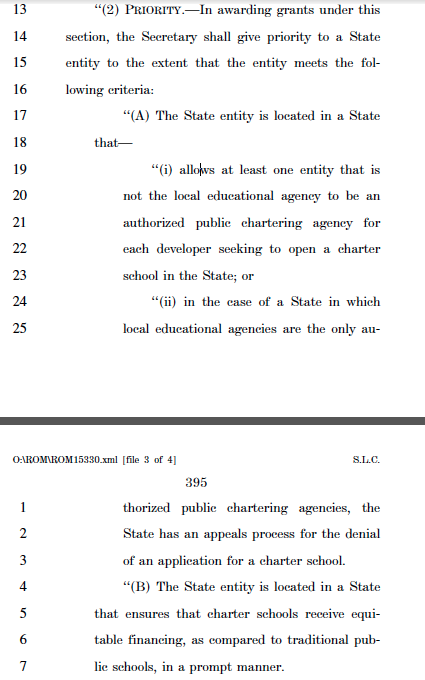 Why should they be allowed to spend taxpayers' money on charter schools, which, as far as I know, are not evidence based? They should not be allowed to do so, of course. The present trajectory of public school destruction will only stop, however, when the corporate government understands that the continuation of the present system is too dangerous or too expensive, or both. This won't get done by talking about it, but by acting from the justifiable outrage that should be tearing at every patriot's heart. Bodies will be required.